On Friday May 12th, a ransomware campaign (WannaCry) began to spread across the internet impacting thousands of systems at a large number of organizations including healthcare providers, corporations, and Universities around the world. While we have not seen any evidence of this malware here at the University of Guelph, it is extremely important that all users are aware of the threat and are on guard to protect our systems and data from it. The intention of this blog post is to provide everyone on campus with a summary of the threat, what we are doing to protect the University, and give users additional security awareness material to use themselves and share with others. What is Being Done to Protect the University? If My System is Infected Should I Pay the Ransom? Use Central Storage - Use a central storage service such as CFS for critical data. CCS central storage is regularly backed up and can be restored very quickly. Practice safe web browsing habits - keep your browser and extensions patched, do not click on pop-ups, use a pop-up blocker, avoid clicking on unknown links, and only visit known trustworthy sites. Ransomware is a type of malware that infects computer systems, restricting users’ access to the infected systems and files. Ransomware attempts to extort money from victims by displaying an on-screen alert which alerts the user that their system has been locked and their files have been encrypted. Users are told that unless a ransom is paid, access will not be restored and their files will be deleted after a period of time. The ransom demanded varies but is frequently between $200 and $400 dollars and must be paid in virtual currency, such as Bitcoin. WannaCry is a new ransomware variant which spreads like a worm leveraging a Microsoft Windows vulnerability (MS17-010 ) to distribute itself. This is a SMB vulnerability with remote code execution options. Once a system is infected, user files are encrypted, additional malware is installed, and the ransomware attempts to spread across the network. Encrypted files contain the file extension .WNCRYT. 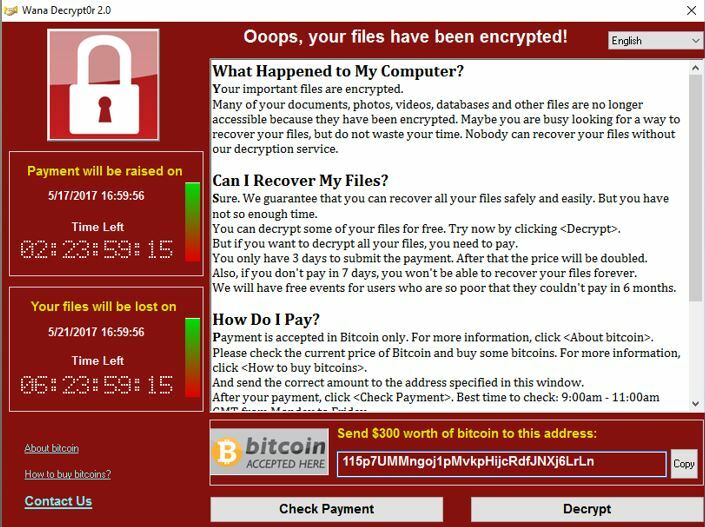 Victims’ computers then proceed to display a message (pictured above) with a demand for $300 to decrypt the files and instructions on how to pay the ransom. If you receive a message like this, please delete it immediately and report it to the CCS Help Centre . Once the malware has been installed on a system, it has the ability to spread through the network to vulnerable systems using SMB file sharing. Therefore, it is extremely important that all systems on the network are patched, specifically for MS17-010 which was released in March 2017. Any systems infected should be removed from the network immediately and the system must be reimaged completely before it can connect to the University network. Once reimaged, user data should be restored from backups. After paying ransom to unlock your files, you would not be able to trust the system or the integrity of data, as it could now contain additional malware, backdoors, or other malicious code.